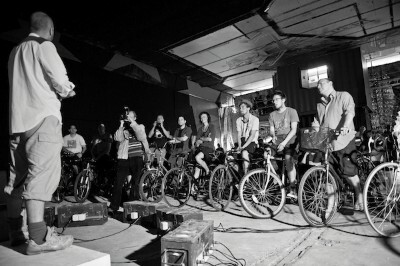 Cycle-In Cinema, 2011. Magnificent Revolution Australia. Photo credit: courtesy of the artists. Republished with permission of Object Gallery and Curating Cities. Public art is one of those attributes of placemaking that we tend to assume is given; just part of the landscape. In the checklists for urban vitality, placemaking and sustainability, public art commonly features. There is a general, almost moral, assumption that public art is a public good that serves a higher social and cultural purpose. Most state arts agencies and many local authorities have experimented with percentage for public art programs, developed public art commissioning and procurement processes, and introduced policy indicating typologies and approaches to public art. Compared to other countries, however, public art in Australia remains a fairly low key undertaking with no dedicated magazines or journals, little media and critical attention, no national networks, a small number of dedicated tertiary programs and maybe the occasional symposium. Therefore, without a well defined community of practice, it’s difficult to map how the critical and curatorial languages about public art develop, particularly as requirements or expectations for public art cross the objectives of built environment practices such as cultural planning, community planning, urban design and urban planning. While the implication is that public art is located at the intersection of various spatial, aesthetic, commercial and urban practices, the approach remains detached and siloed rather than integrated and interrogated. Consequently, questions can arise about how well served our cities and regions are by this approach to public art. Artists and designers can redirect process and practice to assert relational and alternate possibilities. With a resurgence of interest in DIY, tactical and grassroots urbanism, new thinking and methods addressing the role of artists and public art are emerging. This includes the appropriation of such processes by various institutions in a bid for vitality, as an attribute of urban competitiveness. While this word ‘vitality’ is sometimes used to suggest vibrancy, it also means “capacity for survival or for the continuation of a meaningful or purposeful existence” (www.dictionary.com). Vitality and sustainability, then, might be two sides of the same coin with their imperatives of endurance and persistence, of life itself. Here is an open-ended invitation to explore how our art, our professions, our creativity and our behaviour imbue an awareness of survival and meaningfulness. Such repositioning of art and design – from perspectives of structure and agency – is at the heart of an ambitious five year research project that examines how the arts can generate environmentally beneficial behaviour change and influence the development of green infrastructure in urban environments. The project, Curating Cities, is founded on the principle of using art and design to curate – literally, to care for – public space, and places creative disciplines as central to the sustainability agenda. It proposes ‘curating’ as a method for working through the practical concerns of sustainable living. Aspects of this approach emerged at a Hothouse presented by University of New South Wales’ National (UNSW) Institute for Experimental Arts (NIEA) last year. The premise for that event was that “we no longer curate art but curate space. The responsibility to care for space or place extends to all citizens, communities, and industries, as well as to the cultural sector.” The merging of arts, design and sustainability in Australia has gained momentum through initiatives such as Tipping Point and Carbon Arts. With ARC Linkage funding announced earlier this year, the Curating Cities instigated the exhibition Try This At Home at Object Gallery. Led by Professors Jill Bennett and Richard Goodwin, and Chief Curator Felicity Fenner of the UNSW’s NIEA, the project involves a partnership with City of Sydney, Object: Australian Centre for Design, Carbon Arts, and University of Cincinnati. With elements of practice-led research, Curating Cities will unfold through a series of public programs, encompassing exhibitions, labs, workshops and conferences including this month’s exhibition and conference, Curating Cities: Sydney-Copenhagen. This upcoming event will consider the role of public art in urban ecology – and how the tactical interventions and guerrilla actions of artists extend, augment or counter the masterplans of visionary architects and urban designers. There’s an implicit critique and position in these questions which impels practitioners to examine the nature of the human (our) urban planned and designed condition. There is recognition of the ontological dimension of art and design, of power infusing structures of urban management and governance, and of the disruptive agency of artists and designers. The Curating Cities: Sydney-Copenhagen conference will be held on 22 November at Sydney’s Customs House. During this event, artists, designers, curators, educators and creative thinkers will address the fundamentals of urban sustainability – energy, food and resource consumption – and propose strategies for change. The conference will include presentations from the project research team as well as urbanist Jan Gehl, academic/artist Adrian Parr, academic/artist Natalie Jeremijenko, and academic Elspeth Probyn. Parr’s recent work, asserting the global climate as a public commons and a need to reclaim the commons, sets a framework for many of the conference discussions. Artists Slow Art Collective and Rosan Bosch will discuss their approach to urban experiments and community engagement with curator Margaret Farmer. Jeremijenko is launching a cocktail to promote environmentally beneficial eating and drinking, an example of ‘adventurous consumption’ that promotes biodiversity. Professor Bennett stressed the pathways aren’t always obvious, noting that Jeremijenko’s cocktail project is not about denial in the name of scarcity. However, as she pointed out, the environment is a focus of widespread moral concern in which ‘caring’ engenders shift including change of art and design practice. “Caring in this sense isn't just ‘liking’ or caring about; it implies caring for, a much more active proposition that entails taking on the bigger practical concern of producing a sustainable future, which we now realise requires radical change,” she said. This formulation of caring for should also herald change for urban planning and design given the dubious legacy of promoting consumption rather than conviviality. This idea of ‘caring for’ resonates in other conversations about retrofitting cities and relocalising. American urbanist, James Howard Kunstler asserts that we build places carelessly and that no one cares for them; this has a corrosive effect on culture and community. At the recent National Preservation Conference in Boulder, USA, Kunstler jabbed at designers, architects and decision makers, stating that when there are so many spaces that people don’t care about, culture gives up and the civilisation isn’t carried forward. He ended his presentation with a rallying call to “Give us hope. Give us solutions. Greet the signals that reality is sending us (regarding climate and energy). Respond intelligently and build confidence.” That’s perhaps where so many of us are gathering – a kind of crossroads, uncertain, yet readying for meaningful engagement or action. Curating Cities seems to be setting out from that crossroads, recognising the perilous exhilaration in those initial steps. There’s a definite sense of adventure in Bennett’s descriptions of this project. “The challenge is also to expand art and design practices as well as attitudes around public art. The curating cities concept is to move beyond the idea of curating art, and instead to use art to curate (literally, care for) the city,” Bennett said. Bennett stresses the need for collaboration and alliance between artists and other built environment practitioners and decision makers. There is recognition that urban design and planning are processes of urban governance and capital. With the City of Sydney as a partner, there is scope to inflect difference in the local authority and engender culturally enriched ways of thinking about sustainability and place. Bennett also confirmed that discussions with industry are underway. “Environmental action requires more than traditional radical art practice. It is not enough to take up a critical stance; we do need to forge alliances and become increasingly more practical,” she explained. This spirit of adaptivity is captured in the project’s first exhibition Try This At Home, at Object Gallery until 8 January. Curated by Margaret Farmer and featuring works by CO2PENHAGEN, Haque: Design + Research, Magnificent Revolution Australia + Jessica Coughlan, Makeshift and the Slow Art Collective, Try This At Home presents experiments in adaptive practice and encourages audiences to make a change. The exhibition is a show-and-tell of ideas and approaches that offer suggestions for home life. Unlike the plethora of ‘green goods’ and thin streaks of ‘greenwashing’ sweeping the consumerist world and promising little more than ‘sustaining the unsustainable’, this exhibition draws audiences into a dialogue about the way they live via the blog at WeTryThisAtHome.org. The point is not to replace one thing with another or to re-model behaviour change through public awareness, but rather to chart a knowing shift to sustainable living and to multiply modalities of shared experiences, social sculpture and relational participation. This approach recasts those notions of renewal, wellbeing and liveability, which currently pepper strategic plans, as matters of agency. Curating Cities recognises that both aesthetics and politics are involved in shaping the future and that making and doing imply a network of relationships as well as expanding and folding fields. It is the making and doing of everyday life through caring and curating. With its first few public events, this project is presenting visionary ideas about a hopeful future and an art that could be; where an ethos of care and curating attends to the respiration and pulse of our cities.